… your work is to make your life BETTER because of it. In life you always have a choice. A choice to either fall into the victimhood of the “bad” situation or you can muster up the energy to pick yourself up and transform the “bad” into something even better. The choice to either let the situation destroy you or strengthen you is always yours. How you look at a situation determines its power over you. And how you respond to a situation determines the quality of your next life experience. All bad experiences only happen to bring you to a better and higher place. The difficult situations are the real gifts – that’s where the real learning/growing takes place. The happier situations are just the rewards, there is no real growth during those periods. When you can learn to pick yourself up after every fall, dust yourself off and keep going – the best way you know how – the universe always responds in kind and the rewards are tenfold. When you work towards your highest outcome, the universe will work with you to help you achieve that outcome. But when you slump into the lower outcome, it will let you sit there alone in your misery. Do you want to rise up and live your best life? Keep searching for the higher place. Reframe all situations so that your life can be on the up-and-up. You will be given every assistance along the way as long as you are walking the higher side of your path. 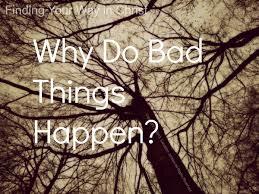 When bad things happen, it is your job to make things better for yourself – any way possible. When you can get into the habit of becoming better for having had those experiences, the universe will bring you everything you desire. The choice is always yours.